BOSTON ? APentagon office is taking advantage of the collaborative nature of the Internetas it studies potential applications for space-based solar power, according toone of the officials leading the effort. The effort marks the first time the NationalSecurity Space Office (NSSO) has conducted a study that relies heavily onInternet collaboration, according to Air Force Col. (select) M.V. ?Coyote?Smith, chief of the NSSO?s future concepts division. Smith is the director ofthe study, which began in late April. In a July18 interview, Smith said his time is the only resource the NSSO hasused on the study, which is due to be delivered to Maj. Gen. James Armor,NSSO?s director, in September. Two other Pentagon officials leading the effortare working on a volunteer basis in their spare time, and John Mankins, aformer NASA official who had led the agency?s work on this topic, is donatinghis time as well to help the NSSO tap into past work, Smith said. Mankinscurrently serves as president of the Space Power Association. A keycomponent of the study is an ongoing discussion moderated by Smith on a Website hosted by the Space Frontier Foundation. The foundation also has helpedcollect input from scientists and engineers who also have been working on the space-basedsolar power issue, in many cases in their spare time as well. The Website, which is located at http://spacesolarpower.wordpress.com,has received more than 5,000 hits since it went online in mid June, Smith said.The Web site features a blog run by Smith, and people interested in the topiccan respond to his posts with feedback. The site also features informationabout the NSSO study and articles on the topic. Based onthe success thus far, Smith said that he would like to see the NSSO open futurestudies up to similar public discussion where classification is not a limitingfactor. JeffKrukin, executive director of the Space Frontier Foundation, which has beenstudying space-based solar power for years, said that he has been pleased withthe collaboration with the NSSO thus far, and would like to work together againon other topics in the future. Krukin said he has welcomed the NSSO?s interestin space-based solar power, as it helps add legitimacy to the concept. TheSpace Frontier Foundation believes there are energyand environmental benefits that could come from space-based solar power ?collecting solar power in space and transmitting it back to Earth ? and thatconstruction of systems for this purpose could provide a major stimulus for thespace industry. For example, it could lead to the construction and launch ofmore satellites, he said. Krukin saidthe idea for collaborating with the NSSO came after an event in April when heasked a Pentagon official who was speaking at a luncheon about the NSSO?sinterest in space solar power after reading about it in Space News. Smith wassitting next to Krukin, and the two began talking about space-based solarpower, Krukin said. 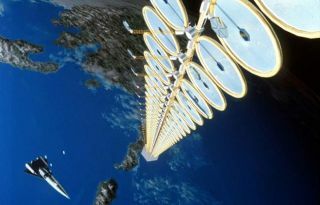 Both Smith and Krukin said while they are excited about thepotential benefits that could come from space-based solar power, they do notview it as a panacea for military or civilian energy needs, and encouraged thedevelopment of other new energy sources. Withsatellites that could collect solar energy and beam it to areas all over theworld, Smith said space-based solar power could help reduce the military?s needfor convoys that carry fuel through dangerous areas, and could be used fordisaster relief operations like the reconstruction of an area devastated by ahurricane as well. ?It?s aformidable challenge ? going back to the Moon might be easier,? Smith said. ?Currently with today?s technology, we can?t do it. I don?t know if thetechnology of tomorrow can close the business case, but the technology from theday after tomorrow will close it. My job is to find the critical path to theday after tomorrow?s technology.? Smith saidthe study is intended to identify various efforts that are ongoing today withinthe federal government to develop critical technology needed for space-basedsolar power, and to use the results to advocate for robust funding for thoseefforts. As thattechnology is matured, energy companies may see that the space-based solarpower concept is viable, and build and operate the satellites and required groundinfrastructure, he said. Onecritical part of the equation likely will be new launch vehicles capable ofcarrying heavy payloads to geosynchronous orbit at a much lower cost than thevehicles of today, Smith said. Significantly reduced launch costs will becritical as limitations with solar array technology, another technology thatwill need to be advanced to enable space-based solar power, likely will requirea large constellation of satellites to handle a small percentage of energyconsumption, Smith said. Smith saidhe hopes to see space-based solar power systems operational by 2050 that couldprovide for a few percentage points of total U.S. energy consumption, andperhaps as much as 10 percent of U.S. energy use by 2060. The pathtoward evolving the technology could involve developing a demonstrationsatellite capable of providing about 400 kilowatts of power that could launcharound 2012, followed by two 2-megawatt satellites by 2017, he said.? Orbital Outposts: A Better Bet than a Moonbase?